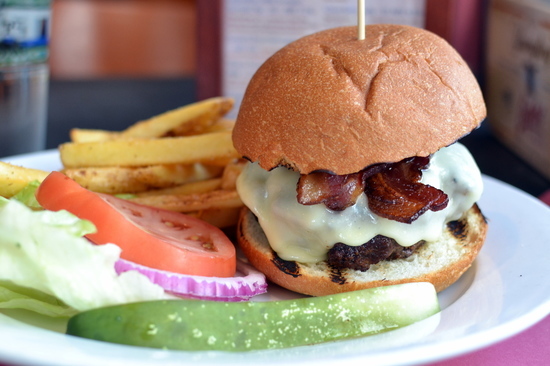 There has been a fair amount of chatter on-line for Tiger’s Den Sports Bar & Grill in Ridgefield so I decided to see if all of the fuss was justified. 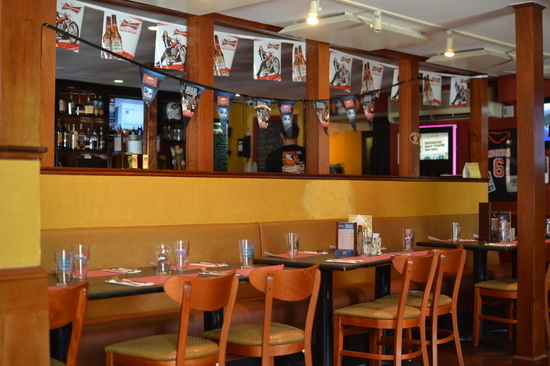 Located AT 25 Catoonah Street, the restaurant itself occupies a stand-alone building in the rear of the property with a separate parking lot and entrance. 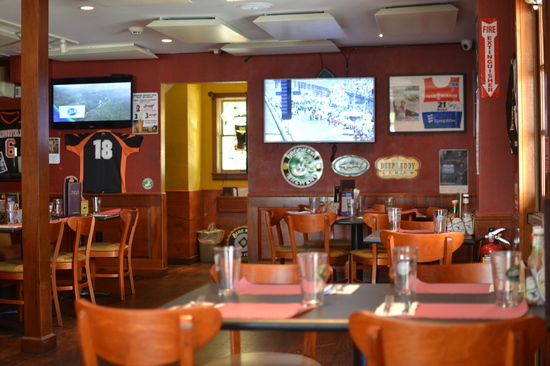 The interior is pure sports bar with seating for fifty at tables and a long front to rear bar with stools. There are six TVs and sports memorabilia adorning all of the walls and 30 beers and mixed drinks occupy a lengthy beverage menu. I arrived mid-day, grabbed a seat in front of the TVs to view three different sporting events and ordered a bacon cheeseburger medium-rare with fries. When it arrived I followed my normal practice and cut it in half. As soon as the knife entered the meat I knew the bad news…it was cooked beyond well-done, hard on the exterior and gray throughout. I sampled one of the fries and it was inundated with salt, not edible. I asked the server for a re-do and he was quick to remove the burger, embarrassed after seeing the burger’s interior. While I waited, the staff was apologetic and asked if I wanted a salad while I waited. They were incredibly customer focused during the entire meal. They were the highlight of the visit. Burger #2 arrived with a new batch of fries. The edges of the burger were very crispy and when I cut the patty in half the middle was borderline raw while the edges were well done, but I was not going to return a second badly cooked burger. Surprisingly the meat was very tasty and offered a nice level of smokiness. 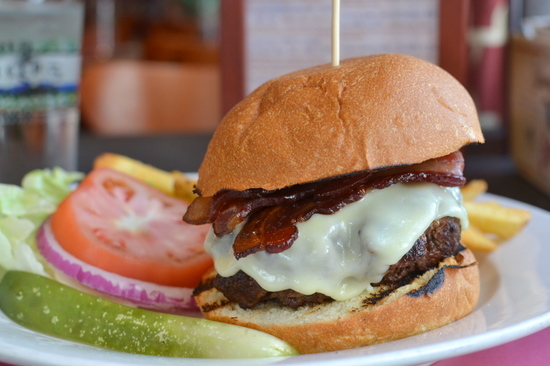 It was topped with two slices of bacon, which were very good and the melted American cheese gave a nice level of creaminess. The brioche bun delivered a descent buttery flavor. Unfortunately like the original fries, the kitchen was careless with the salt, some bites were without any seasoning and other bites were over-salted. It was next to impossible to finish the burger. The fries were scalding hot and again they were over-salted and they were not fully cooked on the interior. Overall it was a very disappointing visit to Tiger’s, not for the ingredients in their burger, which were very good, but with the lack of focus from the kitchen in its preparation. 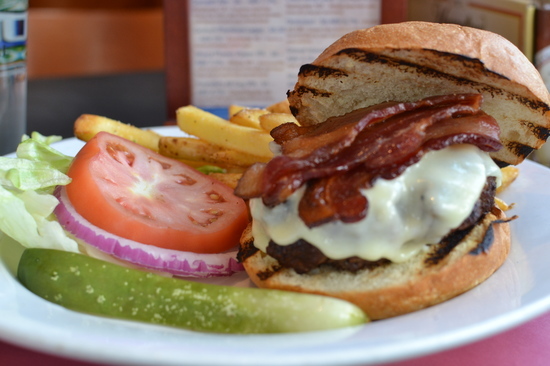 This entry was posted in Ridgefield and tagged #Ridgefield, #sportsbar, Burger, hamburger, Jeff Schlesinger, jfood by jfoodeats. Bookmark the permalink. I am visiting this weekend from NYC, house sitting for my sister in-law. I ordered the burger along with fries and both were very good. Staff and the owner are friendly and it is a good place to watch a game too.